Today I learned that there is a tiny gap in the eave outside my office window. I learned this because I learned that yellowjackets are going in it, through the wall, and out into the room through an even tinier gap in the side of the window frame UPDATE: HOLE IN THE CLOSET CEILING. They’ve come because the weather’s gotten cool and they’re staying because the corner the office is in gets toasty warm afternoon sun. 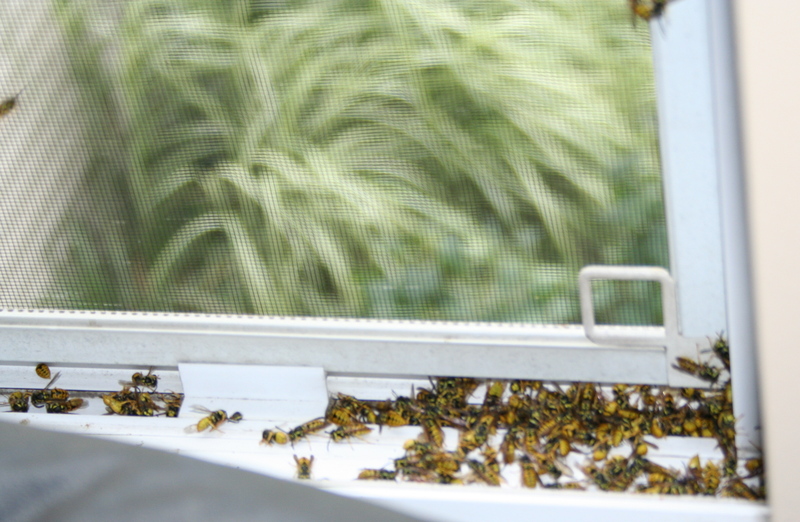 This would explain why I came home last night to find about a hundred bees – and about twice as many today. Here’s a tiny glimpse of the apian convention. I didn’t stay in the room long enough for quality photography. Forgive me. Are you freaked out yet? No? How about THIS. Now that they’re moving in, they secrete something that eats through sheetrock, and I have learned that a swarm of bees can break through a solid sheetrock wall in a horrifyingly short amount of time. UPDATE: NOT “CAN BREAK THROUGH”. “HAVE BROKEN THROUGH”. WE ARE NO LONGER IN THE FUTURE CONDITIONAL. WE HAVE MOVED TO THE PRESENT PERFECT. EXCEPT THAT WITH A 16X24X4 YELLOWJACKET NEST IN MY WALL, THERE IS NOTHING REMOTELY PERFECT ABOUT THIS. Who said learning was fun? LEARNING THIS HAS NOT BEEN FUN. I am trying to stop shaking and shrieking I AM LIVING IN A HORROR MOVIE. But seriously? Liquid that burns through sheetrock? Swarms? Hives? Acid powder that eats through exoskeletons? Hearing the guy whose CAREER is bees say things like “Wow. That’s a lot of bees.” and “We should probably get out of here.”? And by UNSETTLING I mean I AM LIVING IN A HORROR MOVIE. There is only one thing that can make this even very slightly better. AND EVEN EDDIE IZZARD ISN’T HELPING MUCH. UPDATE: ONE MORE THING CAN HELP. THE EMERGENCY EXTERMINATOR WHO IS BORING THROUGH THE CEILING WITH POISONOUS KILLER ACID POWDER. HE MAKES ME FEEL BETTER. HIM AND HIS ACID POWDER OF BEE DOOM.